Learning How to Pulling Up On The Right Maneuver! Pulling up on the left has been a part of the driving test for many years. The new practical driving test will see the introduction of a new manoeuvre; pulling up on the right and reversing two car lengths. 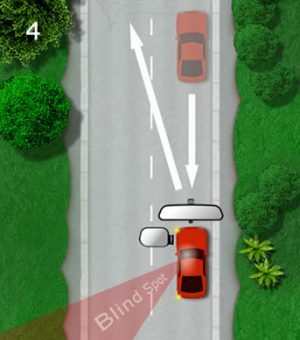 The pulling up on the right, or parking on the right involves driving against and parking against the traffic flow and as such, the controversial manoeuvre has caused much debate, particularly as the Highway Code does not recommend it. It may also be worth noting, it is illegal to park against the traffic flow during the night unless in a recognized parking space. Regardless of opinion, it will become a part of the UK driving test in 04th of December 2017. Though a relatively simple procedure, the manoeuvre, hazardous by nature can easily fail a driving test unless it is performed correctly. This tutorial will explain how to pull up on the right, along with reference points to gain good positioning, plus a section covering mistakes that should be avoided. Observation – to be fully aware of your surroundings, other road users, pedestrians and the ability to act accordingly given changing circumstances. The examiner will ask you to pull up on the right when it’s safe to do so. You will be in a location that the examiner has specifically chosen that is suitable for the manoeuvre. For example, if the road is quite busy, then there will be plenty of room to park safely on the right. There will not be parking restrictions in place such as double yellow lines. You will not be required to pull up on the left before carrying out this manoeuvre. This tutorial assumes you already have knowledge on how to correctly stop a car. Once the examiner has given instruction, observe and locate a safe place ahead to stop on the right-hand side of the road. It’s not a requirement that you must stop behind another vehicle. 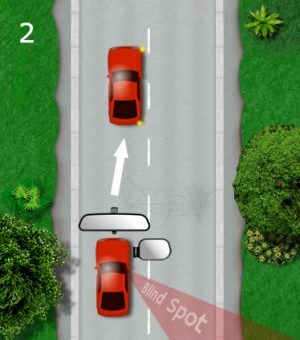 There might be a situation where you have to stop behind another vehicle, or circumstances might change, for instance a vehicle pulls up just in front of you. This will be covered later. If possible, avoid parking directly behind another vehicle. Though you will be reversing, it will obscure your view of the road ahead, making pulling away harder than is perhaps otherwise necessary. Avoid pulling up too close to a junction or opposite a junction. If possible, avoid stopping directly across a driveway where you may impede a driver from entering or leaving their premises. Unless the road is particularly wide, avoid stopping directly opposite a vehicle that is parked on the left as this may impede other road users progress. Once you have located an ideal place to pull over on the right, use the M.S.M routine. Look into your interior mirror, then your right door mirror, followed by a quick glance into the right blind spot. Then if all is clear, signal to the right. 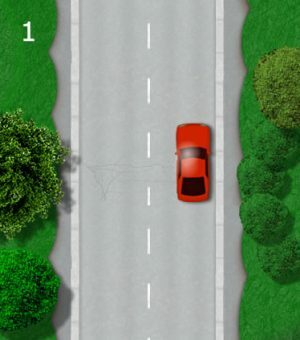 Position your vehicle to the left of the centre of the road (right side of your lane), just as though you were making a right turn. Be prepared to stop and give way to oncoming vehicles. If you do need to stop and give way to oncoming vehicles, take another glance into your mirrors and blind spot before proceeding. Make your way over to the right-side of the road, using a reasonably shallow angle. Moving across the road at a steep angle increases the potential of hitting the kerb. This also makes it harder to stop parallel with the kerb and with straight wheels. 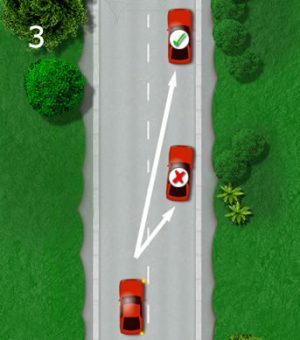 Before moving to the right-side of the road and if you do need to stop and give way for oncoming vehicles, leave a good distance from where you have stopped to give way and from where you intend on pulling up (think around 8 car lengths). This will avoid pulling up using a steep angle. You’ll need to stop reasonably close to the kerb, around 20 to 30 cm is fine. Avoid hitting the kerb as this will likely result in a test failure. You will shortly be reversing, so to make the situation easier for yourself, stop straight (in line) and parallel with the kerb and stop with your wheels straight. Cancel your signal if applicable and if you have stopped on a slight slope and if there’s a risk of rolling, you may apply the handbrake once stopped if you wish to do so. The examiner will now ask you to reverse for around two car lengths. If you have stopped straight and parallel with the kerb and with straight wheels, this should be an easy process. Select reverse gear and before moving backwards, take a look ahead to ensure there are no oncoming vehicles. If there are, wait for any vehicles to pass. If all clear take a look into your mirrors, then finally look in the direction your’re going – out the rear window. Whilst looking out the rear window, begin reversing slowly – think slow walking pace. Continuously look around in all directions. If there are vehicles passing on the same side of the road as you, stop and wait for them to pass. If there are passing vehicles passing on the opposite side of the road, you should be safe to continue. If another vehicle pulls in either in front or behind you, stop and wait until they have finished moving. When you have reversed approximately two car lengths, or the examiner asks you to stop, stop the car, apply the handbrake and select neutral. The examiner will now ask you to move away when you’re ready. To move away safely, select first gear, look ahead to ensure all is clear, look into the interior mirror, the left door mirror and look over your left should into the blind spot. Look ahead and if is clear, signal to the left and move off. The pulling up on the right exercise will in most cases go without issue. There are of course complications that may arise and this guide explains the potential issues and what should be done. Manoeuvres are always made easier with the use of reference points that allow a driver a better understanding of where their vehicle is.